Saw the following picture from Lalguḍi near Tiruccirāpaḷḷi, Tamilnadu at Net. This is a rare form of my father. The sculpture has a Jaṭābhāra on the top with a karoṭikā (skull) at the centre. The Lalāṭa paṭṭa is well fixed he smiles with a divine pleasure though he has sharp tusks. He has Makara kuṇḍala on the right ear and Patra Kuṇḍala at the left. He has a thin Kaṇṭhikā followed by a rudrākṣamālā. The sacred thread crosses across his chest in Upavīta fashion. He has a third eye (here covered with sandal paste). He has serpent Keyūra on his arms. The upper hands have Triśūla and a Khaṭvāṅga (skull capped bone club). Between his lower hands the right hand’s possession is not clear and looks like a Lute like thing. The left one seated on the thigh is damaged. 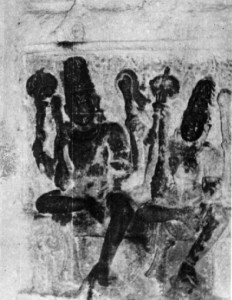 He has Udarabandha and seated on Sukhāsana. His right leg touches the ground and the left is rested horizontally to the right side. He is seated on a Padmapīṭha. This form is very rare and referred as Mahākāla in Lalitopākhyāna. According to the text, he is accompanied with Mahākāli. 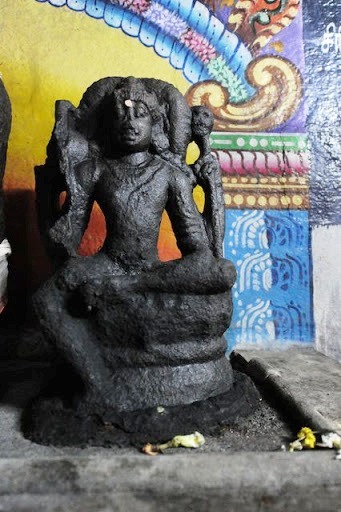 The very same sculpture with Mahākālī can be seen from the panel behind the śivaliṅga of Ṛṣabheśvara shrine inside the Ekāmranātha temple. The temple is dated to Rājasiṃha pallava (690-720 CE) on structural evidences. Based on this sculpture the Ṛṣabheśvara shrine is attributed as the worshipping place of Kāpālikas. Iconography Kanchi, Lalgudi, Mahakala Siva. permalink.